If this sounds like a futuristic, pie-in-the-sky vision of airport accessibility, it’s not. All of these measures and more already are in place at Minneapolis-St. Paul International (MSP), one of a growing number of airports that are going well above minimum standards required by the Americans with Disabilities Act (ADA). Navigation System for Sight-Impaired Visitors: Aira Tech Corp.
Burke elaborates that MSP’s goal is equitable access rather than equal access. Equitable facilities provide everyone with the same experience while equal facilities often mean separate, stand-alone accommodations and features just for travelers with impairments, he explains. Wider restroom stalls are a classic example of MSP’s approach. Instead of adding one or two wider stalls per restroom, the airport made all of its stalls wider. Similarly, it didn’t install one shorter sink among a bank of standard-height fixtures; all sinks stand at a wheelchair-accessible height. “There’s a difference between equal and equitable,” Burke emphasizes. Another good example is pass-through elevators, which allow users to enter on one side and exit through the opposite side. The two-door design eliminates the need to turn around to exit—a difficult maneuver to make from a wheelchair, especially when the elevator is packed with other travelers. “No one has to change their direction; everyone has the same experience,” explains Peterson. Airport officials and architects don’t intentionally ignore the needs of travelers with impairments, emphasizes Peterson. Fully accommodating everyone, however, isn’t always top-of-mind. The key to MSP’s ongoing efforts is a structured approach, says Peterson. In 2014, the airport added a Travelers Advisory Committee to its existing Customer Service Action Council. The committee includes 26 airport staffers and frequent flyers who collaborate quarterly to improve the overall travel experience at MSP. For accessibility issues, the rubber meets the road via an adjunct Travelers with Disabilities Advisory Committee. Also created in 2014, it includes 28 members, primarily local residents with a variety of different disabilities who represent the needs of their wider communities. Real-life perspectives from people with disabilities are invaluable to MSP’s quest for equitable access. Burke points to new holdroom seating as a prime example. Chairs marked with the familiar wheelchair symbol used to be blue, while all other nearby chairs were black. Committee members asked airport officials to make the designated chairs black, too (but retain the wheelchair symbol), so users wouldn’t feel different from everyone else. As another example, Peterson cites the airport’s decision to install new tables in dining areas. Although two-person tables supported by a central pedestal are standard in most airports, the pedestals prevent wheelchairs from rolling far enough under the table for comfortable use. The solution at MSP? Install two-and four-person tables supported by corner legs instead of central pedestals. Another subtle change involved shifting from escalators to elevators as the dominant means of vertical transportation. 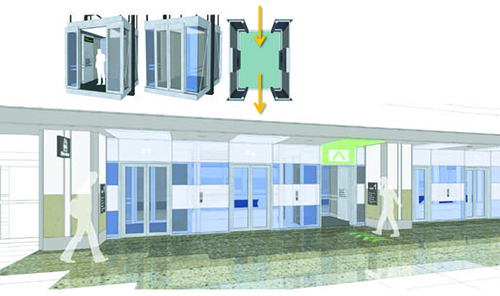 Elevators (especially pass-throughs) are more convenient and safer for mobility-challenged people than escalators. As such, Peterson says it simply make sense to design more elevators into facility plans. In October, MSP opened a station that repairs and services mobility equipment such as wheelchairs and scooters. After testing the new concept, the concession was ready for customers during the busy Thanksgiving and winter holiday travel seasons. The station is run by Scootaround, which also provides replacement equipment and offers short-term rentals. While many accessibility programs center on mobility challenges, MSP broadened its efforts to address the needs posed by other disabilities, such as sight and hearing impairments. 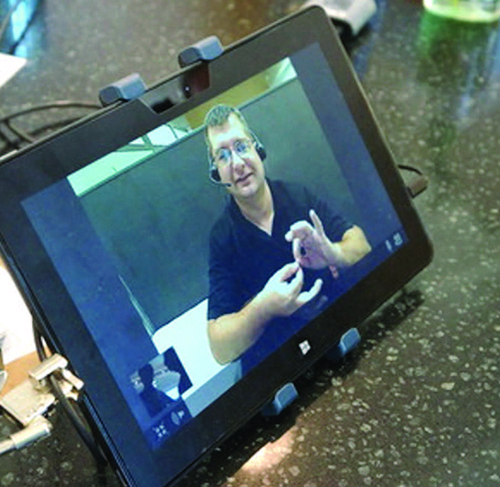 A good example is video-relay interpreting for visitors who use American Sign Language. The ADA code requires TTY (TeleTYpewriter) devices at a limited number of pay phones for people who are deaf or hard-of-hearing, but the airport chose a more modern approach. Input from its advisory committee led MSP to deploy a video-based option from Voiance Language Services. 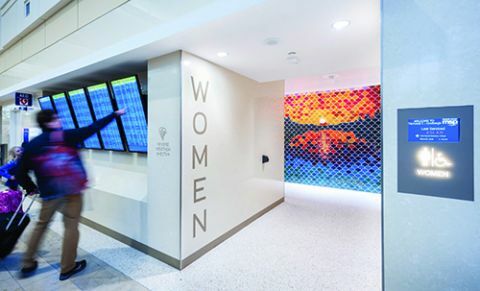 Here’s how it works: Travelers can pick up an iPad at any information booth, and an assistant helps them connect on screen with an interpreter who is fluent in American Sign Language. “It turns into a three-way form of communication between the interpreter, the customer and the assistant who helped the customer log in. It’s working out beautifully,” reports Burke. The airport pays $2.49 per minute for the service, with monthly bills amounting to a few hundred dollars. Multiple iPads are available at each of its 10 information booths, with coverage in both terminals. In a similar vein, MSP is testing a tech-based solution to help vision-impaired customers navigate the airport. The system, developed by Aira Tech Corp., includes eyeglasses with cameras mounted on the frames. When a user dons the glasses, the camera transmits whatever the wearer is “seeing” to a remote assistant, who verbally narrates whatever route the airport visitor takes. MSP also works to address the special needs of many other visitors, including those with cognitive and psychological challenges and height and size extremities. For many years, personnel have offered monthly tours and programs designed to familiarize travelers with autism (especially children) with the airport’s layout and process. (For more details on the program, consult our Sept. 2014 issue.) In 2015, MSP expanded the program to include any traveler who wants to feel more comfortable with the airport experience. The goal is to reduce stress for customers by providing practice with typical procedures such as entering the terminal, checking in for a flight, going through a security checkpoint, boarding an aircraft and finding the right seat. Gender-neutral restrooms are a welcome addition for transgender customers and families or caretakers assisting opposite-gender travelers. The airport also offers special facilities for pregnant and nursing mothers, the advanced elderly and guests with service animals. Moreover, plans are in place to add adult changing stations in 2018 or 2019. As more airports raise their standards for accessibility, architecture and planning firms will need to follow suit. Peterson predicts that they’ll find the process gratifying. “At Alliiance, we enjoy creating places where people can live their lives to the fullest,” he relates. “Airport and travel are exciting things…and to be able to make a difference in travelers’ lives is a strong motivator for us. Through working with MSP, our awareness has grown considerably; they have opened our eyes to the importance and power of equitable design. When spinal surgery forced Eric Lipp to use a wheelchair for two years, the experience provided an epiphany that prompted him to establish the Open Doors Organization, a nonprofit group dedicated to improving accessibility in travel and tourism for people with disabilities. Airports that don’t make facilities as accessible as possible do so at their own risk, he notes. Each year, approximately 6 million air travelers self-identify as having a disability, and they spend an average of $20 per person at airports. Conservatively, that amounts to $120 million a year. Lipp suspects the spending total may be even higher, because many people won’t admit they have a disability when asked. “I know of one big airline that’s pushing 1,500 wheelchairs a day,” he notes. Lipp highlights Minneapolis-St. Paul International (MSP) as a national leader in airport accessibility. He commends its attention to detail, right down to the mechanics of restroom doors. Instead of closing completely, they stop about a quarter-inch from the doorframe, so blind people can use their canes to discern if a stall is occupied. “That’s just good design,” he comments.